Grand Detour, Illinois. —. Early French traders who traveled the Rock River named the large bend southwest of this point, Grand Detour. Winnebago and Potawatomi villages in the area made it a prominent location for fur trading posts, and during the 1820's the United States government granted licenses to traders at "Grand Detour on Rocky River." Permanent settlement at Grand Detour began after Leonard Andrus traveled up the Rock River in 1834 in search of a town site. Impressed by the natural beauty of the region and the power and transportation potential of the river, Andrus claimed the land and in 1836 laid out a village. A year later John Deere, a Vermont Blacksmith, settled in Grand Detour. While working in his shop, Deere heard farmers lament that the rich Illinois soil stuck to the wooden and iron plows they had brought from the east. Deere tackled the problem and shaped a steel plow out of a discarded saw blade from the Andrus sawmill. The soil slid smoothly off the highly polished steel surface, and as the demand for his plows increased, Deere began production using steel imported from England and later from Pennsylvania. High freight costs forced him to seek better transportation facilities, and in 1847 he moved from Grand Detour to Moline, Illinois, on the Mississippi River, where he began manufacturing plows in quantity. Early French traders who traveled the Rock River named the large bend southwest of this point, Grand Detour. Winnebago and Potawatomi villages in the area made it a prominent location for fur trading posts, and during the 1820's the United States government granted licenses to traders at "Grand Detour on Rocky River." Since the Rock River was never developed for navigation and the railroads bypassed the community, Grand Detour retains much of its nineteenth century atmosphere. Erected 1987 by Illinois Department of Transportation and The Illinois State Historical Society. Location. 41° 53.773′ N, 89° 24.761′ W. Marker is in Grand Detour, Illinois, in Ogle County. Marker can be reached from Illinois Route 2. Touch for map. Can be viewed from parking lot near the river. Marker is in this post office area: Dixon IL 61021, United States of America. Touch for directions. Other nearby markers. At least 8 other markers are within 6 miles of this marker, measured as the crow flies. Upper Ferry Landing (within shouting distance of this marker); Erected to the memory of Leonard Andrus founder of the village of Grand Detour Illinois 1835 (within shouting distance of this marker); The Grand Detour Plow Factory (within shouting distance of this marker); La Sallier's Cabin (approx. 0.9 miles away); Lincoln in the Black Hawk War (approx. 5 miles away); Abraham Lincoln (approx. 5.1 miles away); Lincoln Supports Fremont for President (approx. 5.1 miles away); Berlin Wall Replica (approx. 5.1 miles away). Touch for a list and map of all markers in Grand Detour. More. 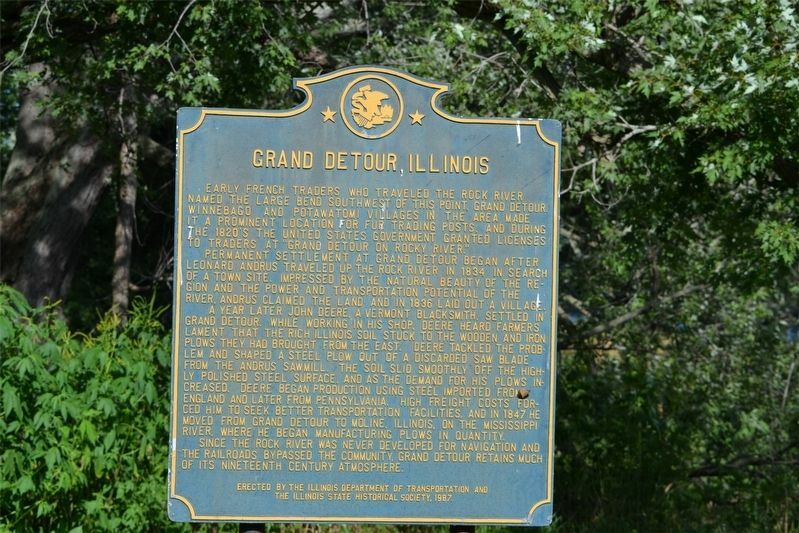 Search the internet for Grand Detour, Illinois. Credits. This page was last revised on March 22, 2019. This page originally submitted on March 22, 2019. This page has been viewed 48 times since then. Photo 1. submitted on March 22, 2019. • Bill Pfingsten was the editor who published this page.